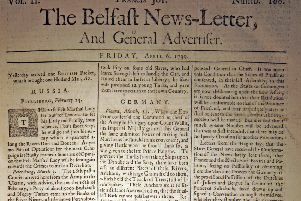 The fifth surviving News Letter, dated January 9 1738 (which is in fact equivalent to January 20 1739 in the modern calendar). Naples. Dec. 9. The Baron de Neuhoff with two of his Relations were seized on the 2d of this Month by the Officers of the Government, in the House of the Dutch [?Consort? Consul? word cannot be made out due to condition of the paper]. It is given out, that it was only to save him from some Attacks, that were designed upon him; but we are assured, that it was done at the Request of a Foreign Power. Leghorn, Dec. 23. The Mountaineers in Corsica absolutely refuse to give up their Arms till they are assured, what are the Terms of Accommodation. Paris, Dec. 27. The Prince de la Torrella Caracciolli, Ambassador from the King of the Two Sicilies, having received an Express from Naples with important Dispatches, went thereupon to Versailles, were he declared to the Ministers of the Court, that his Sicilian Majesty, out of Regard to the King’s Representations, did, on the 21st ult. O.S. cause Baron de Neuhoff to be apprehended in a House at Naples, from whence he was immediately carry’d to the Castle of Gaeta, where is to be kept Prisoner till the Restoration of a perfect Tranquility in the island of Corsica; after which he will, in all Probability, be set at Liberty, on Condition that he never meddle any more with the Affairs of that Island. They write from Bastia, by way of Leghorn, that as soon as the Count de Boisseux received the News of the Seizure of Baron de Neuhoff, he sent an Officer to spread it amongs the Malecontents; and at the same Time to represent, that being thereby deprived of all Hopes of Support, nothing ought to hinder them from submitting to the Terms of Accommodation which had been proposed to them. Letters from Genoa say, that the Senate and People make great Rejoicing an Occasion of the Baron’s Confinement. LONDON, Dec, 21, 23, 26 and 28. Yesterday at Noon an Express arrived here from the Earl of Waldergrave at Paris, relating, as we hear, to the Affairs of the Island of Corsica. We have advice from the Coast of Africa that Mr. Gawer, who has been many Years Surgeon in the Company’s Service, has been murder’d by some of the Negroes on the Coast. Vienna, Dec. 20. The Report of Prince Ragotski’s Death continues, tho’ the different Places he is said to have died in, as Widdin, Constantinople, and Walachia, leave it still uncertain. The Gold Cup, which his Royal Highness had ordered to be made for the Corporation of Bath being finished, was this Day sent down to that City.